The secret’s out: Lonely Planet recently picked Canberra as the third best city to visit in 2018, marking the city’s renaissance as a tourist destination. But what does it offer for history lovers? In this article from issue 31 of Inside History, Sarah Trevor explores the capital, from the hallowed halls of its grand civic institutions, to its lesser-known historic treasures. A confession: my first impressions of Canberra, as a high-schooler on the mandatory, rushed excursion through the nation’s capital, were less than dazzling. Surely the city deemed most worthy of representing Australia — indeed, created for this very purpose — should, I reasoned, have more, well … life? Perhaps this was the result of an overcrowded itinerary, or preconceived notions formed prior to even arriving. Maybe the city’s relevance to the curriculum robbed it of appeal, tainted by association with schoolwork. Whatever the cause, the bias was set. Little did I realise that Canberra had other plans. Over several return visits — each one induced by a love of history — my mistake became clear. The problem with such a blinkered view towards the nation’s capital is that it is the nation’s capital: a hub, a repository of much of its most precious artefacts, its founding documents, its stories in all their rich variety. For a history aficionado, such a place could never be lifeless. To dislike Canberra is simply incompatible with a love of Australian history. Because, at its very core, it is a cluster of Australian heritage. A round-up of some of the country’s best cultural institutions, brimming with stories and treasures from across the continent, all pre-packaged into an orderly city. Oh, and for the record — there is plenty of life in Canberra, the not-yet-historical variety included. You just have to know where to look. Despite its name and eminent status, the National Museum of Australia is not your average national museum. There’s no imposing or stuffy grandeur to the place, for one; no endeavours to floor the visitor with sheer architectural might. As a building, it’s quirky and postmodern, rather than intimidating and ornate. There’s no regimental organisation of subject matter, either. Its dizzying range of artefacts sprawl about thematically rather than strictly chronologically. The layout itself seems to ramble and saunter. That’s partly why even those who detest museums would, I’d wager, enjoy a few hours here. Another reason is the rich, almost overwhelming array of objects and stories on display. To name but a few, there’s Renaissance-era maps and Phar Lap’s heart, the Endeavour’s cannon and Germaine Greer’s coat, an Italian migrant’s bicycle, 40-odd convict tokens, a war correspondent’s footage, Indigenous tools and weapons, a dancer’s costume, 18th-century Dutch coins uncovered in northern Australia, a sweetheart ring from 1916 — and more. Best illustrated in its richly symbolic outdoor courtyard, the Garden of Australian Dreams, the National Museum aims to represent Australia in all its diversity: geographic, cultural and temporal diversity alike. As such, whichever era or area of Aussie history intrigues you most, you’re sure to find something of interest here. Australia War Memorial. Courtesy John Torres. You don’t have to be a military history buff to spend hours, if not days at the Memorial, absorbing the masses of material that reveal a multitude of Australian experiences of war. The lifelike recreations of trenches; panoramas of battlefields; touching personal possessions of soldiers, nurses, and those caught in the crossfire. But what you may not be prepared for is the emotional resonance. Particularly haunting is a small, dimly lit room commemorating the Sarakan death march. Hundreds of black-and-white photographs of prisoners of war stare out at you while the audio recording of a survivor recounts the horrifying ordeal. Some 1,787 Australian prisoners-of-war died in North Borneo during the death march. Only six survived. However many hours you spend at the Memorial, be sure to make time for the Last Post ceremony each afternoon. Located some 30km from the city, on a working farm (complete with lazing cows), Lanyon Homestead feels worlds away from the pollies, public servants and roundabouts of Canberra. Its 1850s-era homestead has such an authentic, lived-in feel that you could almost believe its inhabitants just stepped outside for a minute. Its heritage furnishings, rambling fields, and historic outbuildings make for a fascinating outing from the city. Think the National Archives are only worth a visit for family history research purposes? You’d be mistaken. A vast collection of images, records and artefacts of Australian history (with a particular strength in 20th-century history), plus ever-evolving high-quality exhibitions, awaits you at the Archives. There’s the late Harold Holt’s briefcase, the 3m long Larrakia petition signed by 1,000-plus Indigenous people, footage of Johnny O’Keefe performing on Six O’Clock Rock, and more. Hints at some unsettling aspects of Australian history are visible too in an Index of Aliens from World War I, national service ballot balls, and a dictation test from the White Australia era. The permanent exhibition that greets you upon entering is worth at least an hour’s perusal alone. Don’t miss the stunning wall-length collage of 200-odd images, the Faces of Australia. National Library of Australia. Courtesy Martyman. Just down the road, and every bit as immersive, is the National Library of Australia. Even for repeat visitors, the Treasures Gallery is a must, beckoning with unexpected delights and answering questions you may not even realise you had. Its portraits of early explorers put faces to familiar names, while a display of early maps and an exquisite celestial globe contextualises the history of exploration that led Europeans here in the first place. Then there’s the digital display: a touchscreen allows you to chart Cook’s voyage around the east coast and beyond with corresponding entries of his journal (even keyword-search enabled). A colourful, varied picture of Australian history emerges throughout the gallery. Look out for the ‘Hairy Wild Man of Botany Bay’, and the legendary gentleman pickpocket George Barrington. Featuring an unparalleled catalogue of Australia’s audio and video recordings, and associated artefacts like posters, memorabilia, costumes, props and more, the National Film and Sound Archive deserves a firm place on your list. Firstly, there’s the heritage building in which the Archive is located. Built in 1930 as the Australian Institute of Anatomy, it’s a striking Art Deco structure with a uniquely Aussie stained-glass skylight. But, of course, the primary reason to come is to take a seat in either of its two theatrettes, sit back and enjoy the vaguely nostalgic viewing experience. Snapshots of the Archives’ vast collection of footage of everything from home skits and football announcements to war reports are frequently screened. A real treat for history enthusiasts. The only cultural centre in Australia dedicated purely to contemporary glass art, Canberra Glassworks is a personal favourite. Marvel at professional glass artists at work (or try it for yourself, under their guidance). And what work it is, to create art and sculpture using massive, fiery furnaces blazing at up to 1160°C. But for history lovers, the heritage-listed building in which the Glassworks is housed is almost as worthy of artistic appreciation, as Canberra’s oldest permanent public building. The former Kingston Power House is a striking example of industrial heritage come modern drawcard. An enthralling site overall. Next stop is Royal Military College, Duntroon. Drive up a winding road until you reach the top of Mount Pleasant for, as the name would suggest, lovely views of Lake Burley Griffin and surrounds. But history lovers will enjoy more than just the view, with informative signposts revealing more of the capital’s past. Look out for the grave of General Bridges, who was the only Australian soldier killed at Gallipoli to be buried in Australia. General Bridges’ Grave, designed by Walter Burley Griffin. Courtesy AYArktos. While you’re in the area, take a moment of quiet reflection and consider the touching legacy of an infamous Japanese prisoner-of-war camp. Changi Chapel, built in 1944 by Allied prisoners of war, was brought to Australia after the war and re-erected as a national memorial on the grounds of Duntroon. Another ‘recycled’ Canberra church with an interesting history is found in the leafy suburb of Ainslie. The stonework of what is today All Saint’s Church came from a rather unlikely source: between 1869 and 1948, it was a mortuary railway station in Sydney’s Rookwood Cemetery, used to transport the dead to their final resting place. It was purchased by the parish, transported to Canberra and rebuilt, with some major adjustments. Worth a visit. Amidst the serene Tidbinbilla Nature Reserve, nearly an hour’s drive out of central Canberra, is one of the region’s most significant Indigenous sites. Follow a 3km trail through open fields — passing a kangaroo or dozen along the way — and you’ll come across Birrigai Rock Shelter. Archaeological studies found it was originally occupied more than 21,000 years ago, yet the shelter was still used up until the mid-19th century. You may just have it all to yourself. View of Canberra from Mt Ainslie. Courtesy Jason Tong. Peppers Gallery Hotel, Canberra, set in the arty NewActon precinct, is a heritage-listed site — formerly the Hotel Acton building. A boutique hotel, its interiors offer a good mix of luxe and quirky. Bicicletta, the in-house restaurant of Peppers Gallery, is a charming Italian trattoria (and does a good breakfast). Monster Kitchen and Bar in the nearby, architecturally dazzling Hotel Hotel offers interesting twists on seasonal produce. The famous Brodburger, now located beside Glassworks, is a Canberra institution. Hearty meals and atmosphere. Any history lover’s Canberra experience will be enriched by the Canberra Tracks app, which Inside History reviewed in issue 30 (free; iOS and Android). Best to consult prior to arrival. For a deeper insight into the Acton region, try the heritage walk on the ANU Walks app (free; iOS and Android). If you love science as much as history, try the Mt Stromlo Heritage Trail app (free; iOS and Android) and learn more about this fascinating part of our past. Read more of Sarah’s travel tips, tricks and stories at World Unlost, a travel blog for history lovers. 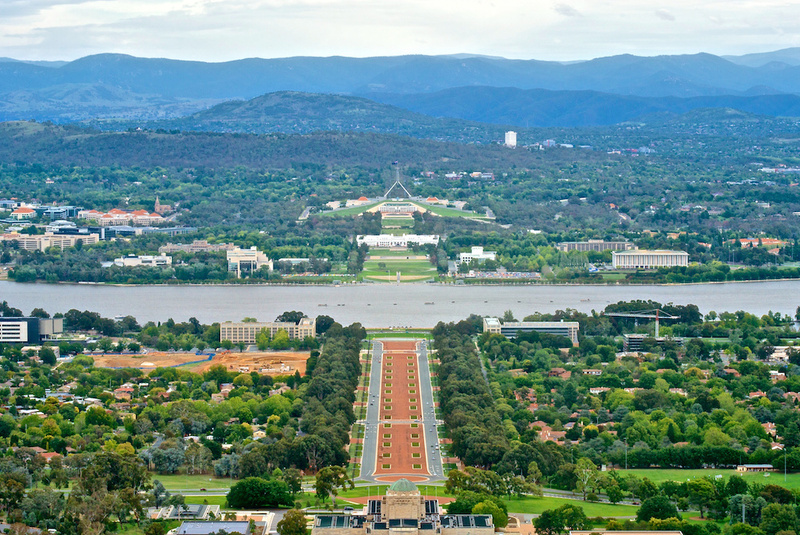 Sarah travelled as a guest of VisitCanberra.